Probe is a private intelligence organization. It is part of a much bigger conglomerate known as the World Securites Corporation which operates around the world as a combination fact finder and security provider. In an ever changing world where bad things happen, if a person or a company needs a little extra protection or help, there is some division in the WSC that can help. All for a good price, of course. The operations of this highly technologically sophisticated company is housed in a 48-story building two blocks from the UN in New York City. Though the company itself is huge, many of its departments are kept very quiet, doing their jobs in the background. One such department is Probe, occupying the top eight floors of that building. Most of the space is filled with the latest in computer and other electronic equipment all created by the genius of its overseer, V.C.R. Cameron. It also houses a control room even NASA would have been envious of. From this room, technicians under Cameron's direction monitor the agents of Probe as they went about their missions. This monitoring is done through the wizardry of Cameron's inventions which includes miniaturized television scanners which are able to not only send the sights and sounds witnessed by the agent but also considerable medical information. Not only could the watchers know how the agent was faring, they could get a fair idea about anything or anyone the agent encountered. A special audio device implanted behind the ear of the agent allowed the monitors to talk to the agent and a beeper-like item in a tooth could be used to send Yes-No responses back from the agent. The international aspect of World Securities Corporation (sometimes called World Securities, Inc) and its division, Probe, coupled with the successes they produced, made the intelligence agencies of the Western powers natural clients, though they were not the only ones. Whoever the customer was, the primary role of Probe was to search and retrieve whatever the client wanted. Probe has operatives around the world as needed but for the main work it relies on three highly gifted agents. Leading the pack is Hugh Lockwood, codenamed Probe-One, who handles any case that comes his way though he stays out of any mob related matters. Those are left to the second agent is Nick Bianco - Omega Probe - who took those organized crime assignments because of years of law enforcement experience. Waiting in the wings is the third agent, C. R. Grover, also known as Standby Probe who is sent in whenever needed to help out. All three, and others unspecified, are controlled by Cameron. 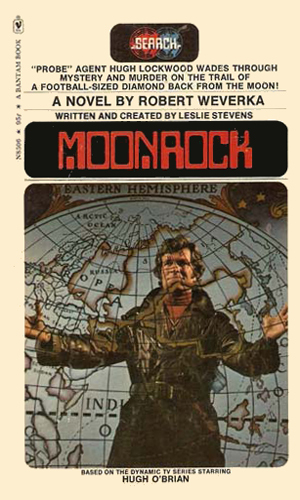 Lockwood is the agent dispatched to find the man who has stolen a huge, seven and a half pound diamond discovered by astronauts on the moon and brought back to Earth for study. The thief, a member of an Arabic organization, has taken it and Probe is hired by the U.S. to retrieve it. This is also a novelization of an episode of the same name first shown in October of 1972, again written by Leslie Stevens. A made-for-tv movie acting as a pilot for the series, this presented Hugh Lockwood as he is sent in search of a large amount of stolen diamonds. 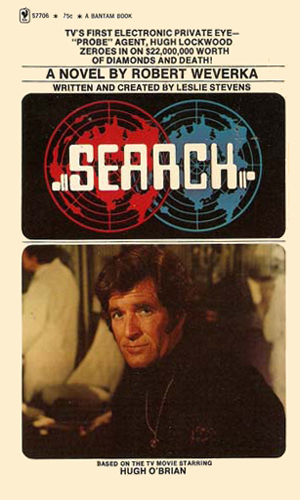 In February, 1972, NBC presented a pilot movie entitled Probe and followed up the next September with a television series entitled Search. This show would last only 23 regular episodes, ending in August of 1973. The show was ahead of its time. Its high-tech gadgetry might be somewhat ahead of what is the norm even now but our routine use of hand-held computers, cellular phones, and TV walkmans makes it seem believable. Such was not the case 30 years ago when it was all a bit much. It was also in a lousy time - 10pm when it was beyond the reach of its best audience, kids and youngsters. Finally, add in a dispute between the creator/producer, Leslie Stevens, and the network which forced him out halfway through the first season. You end up with a short-lived series. It was a shame. This was a fun series that deserved better. It had terrific action actors as its leads. Each show concerned a case involving one of three agents. The three actors were Hugh O'Brian, Anthony Franciosa, and Doug McClure. The division of labor was quite well spread out with the episode count being 8, 8, and 7 respectively. Running everything back at Control was Burgess Meredith with the assistance of Angel Tompkins and A Martinez. Lockwood is in Washington DC to find out if a missing diplomat and member of high society is just off with a mistress or a victim of something bad. A fellow Probe agent disappears while checking a couterfeiting operation and Bianco is called in. One agent is already dead trying to stop an angry scientist with a device that can disrupt communications, one who is heading to Probe headquarters. WSC was in charge of security for the transfer of a huge diamond brought back from the moon when it was stolen and Lockwood is sent to find it. 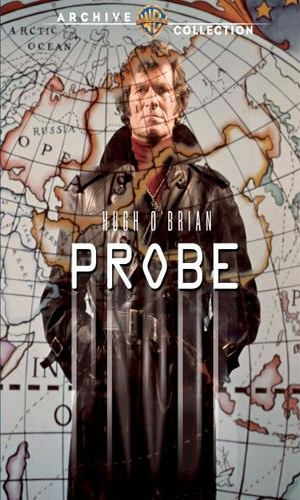 When a Probe agent dies investigating a very secretive European crime figure, Bianco is asked to find out what happened but his first order of business is finding the agent's body. The man known as the Iceman is said to be after a US Ambassador. Bianco leads a group to stop him but someone on the team is not playing for the same side. An Eastern European country has developed a bullet with a quick acting poison in it and Lockwood is sent to get the formula but he is shot with the very weapon. A reclusive billionaire has been out of sight for 18 months. A major newspaper hires WSC to see if he is still alive and Grover is given the job. Lockwood looks into the disappearance of a woman who was the secretary and mistress of a popular talk-show host who is running for the Senate. When a pilot friend of Lockwood vanishes in flight along with a valuable cargo, Lockwood is determined to find the truth even if Probe is not being paid. Lockwood and Gloria Harding work together to locate a missing gold mine in a rugged mountain range. To get revenge on Bianco, a billionnaire kidnaps one of his former girl friends as bait. The daughter of a billionaire vanishes on her wedding day. She is also wanted for murder. She is also a target for other relatives anxious for her share of inheritance. Grover is sent to find her. A Probe agent's wife is killed and his daughter kidnapped by a criminal gang. He heads out alone to get her back and Bianco is sent to help. Grover was not intending to find out about a blackmailing scheme to extort millions from a Swiss bank but once he does, he and Probe go about stopping it. When a WSC diver is infected with a deadly virus, he breaks out of the hospital to find his wife and Lockwood is sent after him to prevent a catastrophe. A major advisor to the President is being blackmailed during disarmament talks and Bianco must use his underworld connections to learn who. Grover suspects a radical band of Thugees has stolen a valuable statue of the Hindu Goddess Kali and he heads to India to prove his theory and get it back. A reporter hot on the trail of a major crime story disappears in Texas and Bianco is sent to find him. Cameron is kidnapped late one evening. Grover is sent to get him back but time is of the essence as the kidnapper is determined to break the tech wizard. The travel agency named "Ends of the Earth" makes its real money helping crooks fake their deaths and then disappearing. Bianco goes undercover as a client. Lockwood is brought in for what seems a routine kidnapping of a daughter of a Wall Street bigwig but he discovers nothing is routine about anything. Grover is looking for an army officer who has gone missing and comes across a rebel band planning a coup. It was a shame that the television series didn't do better as the premise was a natural for spy-fans like me. The stars were all highly capable of pulling off the hi-tech agent roles and the writing of at least those episodes by the creator, Stevens, were very entertaining. The two novelizations show a lot of the magic of the concept, filling in some of the mystique that the shows had to gloss over. They are worth reading. When you do, keep the images of the actors who played the characters in mind to get more enjoyment. Hugh O’Brian had a fantastic suave and smooth air about him. Burgess Meredith with his raspy caustic comments is terrific. And the adorable Angel Tompkins belongs, well, anywhere she wants to be. I enjoyed the series in its heyday. I discovered that I could purchase the complete series and the pilot episode from Amazon, and I did out of nostalgia. Hugh Lockwood's episodes were the best for me as I watched a "secret agent" resolve issues within the hour. Being "wired up" seemed so futuristic and now it ain't. A good series that should have continued on for a few more seasons.